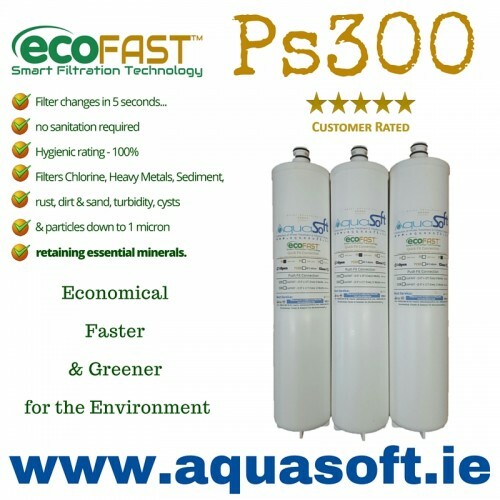 Aquasoft™ Ireland is a proud supplier of EcoFAST™ Quick-connect Series easy change, hassle free Water Filter Cartridges. These quick-fit filter cartridges are easy to change by turning the cartridge slightly anti-clockwise for easy removal and speedy filter change. The filters are sold individually or as a set. Filters should be replaced every six months (manufacturer recommended) to keep your water filter functioning effectively. Varying geographical locations in relation to hardness levels impacts greatly the longevity of filter media expiring or ultimately blocking up. As an Aquasoft™ customer, we will select and ensure placement on a tailored filter cycle based on area, manufacturer recommendation and on our experience in this field. At Aquasoft™ Ireland, we supply high quality filter media and NSF® certified and the Water Quality Association® brands which offer the best quality and safety in drinking Water Filtration. Aquasoft™ uses trusted brands like EcoFAST™, Dow® Filmtec membranes, Everpure® and Doulton® when supplying, installing and servicing water filtration systems. Safety and Quality of your drinking water media should always be a first as we consume it through our bodies. It is important to change the filters in your water filter system on a regular basis. We will automatically put your name onto our customer database and we will notify you, so that your water filter system keeps functioning effectively. We offer this service for all drinking water systems, wholehouse & Commercial systems. Products purchased through www.aquasoft.ie have an extended 3 year warranty for intermittent or factory defects which can occur from time to time due to human error. This extension is valid within 30 days of receipt of purchase through serial number and product registration form via Product Registration portal.